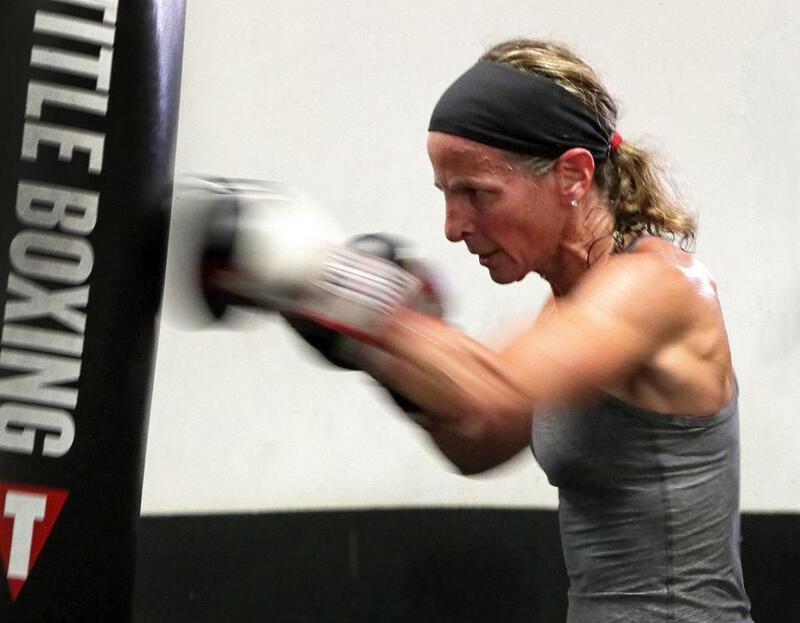 Dr. Suzanne Miller, 49, an orthopedic surgeon, trains for her boxing debut next month in the Belles of the Brawl event at the House of Blues. Suzanne Miller is an orthopedic surgeon and, let’s face it, she should know better. She knows pain. She knows rehab. Her surgical specialty is knees and shoulders, reconnecting ACLs, patching up rotator cuffs, getting her patients back in the game as soon as possible. So why, in the sweet name of doctor, heal thyself, is she looking forward to someone punching her in the face? Because cancer. That’s the short answer, one that requires no further explanation when it’s time to put up a fight. Miller will climb into the ring Oct. 5 as part of the annual Belles of the Brawl boxing event on Lansdowne Street, where she’ll have her first, and likely last, three-round amateur bout to help raise money for cancer research. Raised on Long Island, the 5-foot-4-inch, 124-pound Miller attended the Mount Sinai School of Medicine in New York City and practices at the Boston Sports and Shoulder Center in Waltham. A frequent marathon runner (Boston, New York, Pittsburgh) and fitness devotee, in recent years she watched her husband battle and overcome Hodgkin’s lymphoma, her father win out over colon cancer, and these days her close friend, Noreen Cosentino, is also fighting the disease. Miller training at the Nonantum Boxing Club. So for three very good reasons, Miller these last four months has devoted herself to training at the Nonantum Boxing Club in Newton to prepare for three two-minute rounds under the auspices of Haymakers for Hope, the Boston-based charitable foundation that has raised some $7 million since its founding in 2009. Miller, who can’t remember having even a childhood fight (“Wait, maybe one with my sister, would that count?”) will face Samantha Singer, 44, the COO of the Broad Institute, a pairing that friends and Haymakers organizers are calling the Battle of the Brains. Record-keeping of such things is scant, but it’s believed to be the highest IQ bout in the history of the sweet science. One thing is certain: Miller and Singer have combined for some $60,000 in pledged donations, making it the highest-funded bout in Belles history. The 30 other women who will fight Oct. 5 have raised another $250,000, helping to make it the most richly funded Belles night in Haymakers history. In keeping with Belles tradition, Miller and Singer already have met for one brief sparring session. Haymakers is careful about these matchups, concerned that its fighters are roughly the same age, size, and skill level. Sure, there’s a chance someone get KO’d by a lucky punch, but parity is part of the charity. Miller’s husband will be the in crowd for her fight, and her parents may make the trip from New York for the event. By Miller’s account, Singer is slightly taller, and fires a nice jab. Dena Lawton, Miller’s trainer at Nonantum, will handle her corner. The good doctor’s husband, Christopher Brunelli, a custom home builder, will be in the crowd. Her mom and dad, Rhoda and Jay Miller, possibly will make the trip from New York, though Miller isn’t sure she’s ready for her folks to witness their daughter getting roughed up in the ring. Miller’s 10-year-old daughter Meadow cannot attend because no one under 21 is allowed entrance to the club. It is easy to forget sometimes, but we are fortunate to live in a town full of hospitals that serve as miracle shops, and equally fortunate to have organizations such as Haymakers that help fund the research that leads to the therapies and cures. Miller’s husband, his lymphoma diagnosed at stage four, was made whole again by Dana-Farber. Her dad made it through thanks to the oncologists at Brigham and Women’s. Cosentino, her close friend, is also being treated at Dana-Farber. Oct. 5. House of Blues, where Miller, Singer, and the Belles will let the punches fly. Cancer, we’ve got some Boston girls who are just dying to beat you.